Bradley Landing is a beautiful and cozy new home community located just one mile from Fort Benning’s back gate. These upscale homes feature our best package of all, with stainless steel appliances, granite countertops, ceramic tile, upgraded cabinets, extended hardwood flooring and alarm system in every home. 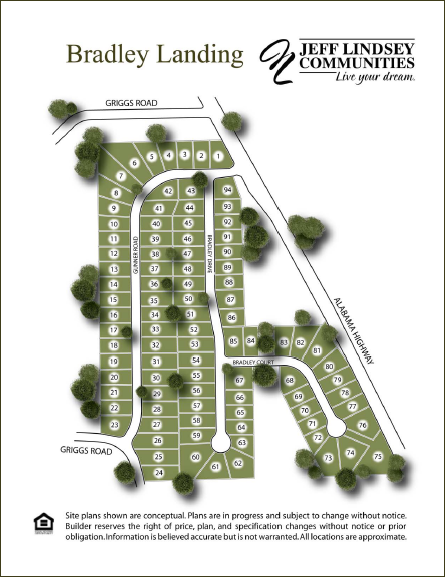 Some lots are nestled in a wooded setting with streetlights, sidewalks and basements available for any floor plan. 431 South Turn left on Hwy 165. Go approx. 3.5 miles past Misty Forest subdivision on right. Entrance is on right approx. 100 yards past Mt. Olive School. © 2019 Jeff Lindsey Communities. All Rights Reserved. Equal Housing Opportunity. Subject to errors and omissions. All information believe to be correct when posted. Website design and development by Rearview Advertising.